Kotaku editor-in-chief Stephen Totilo called The Library Halo: Combat Evolved’s most notorious level. An entry on Halopedia referred to it as one of the least popular levels in the Halo series. The Library is the hardest level in the game by far, a cruel gauntlet featuring seemingly never-ending waves of Halo’s toughest enemies. I love The Library. I think it’s secretly one of the best levels in Halo history. Want to know why? This piece originally appeared 6/1/15. Halo starts out as one kind of video game, but the Library changes all that. 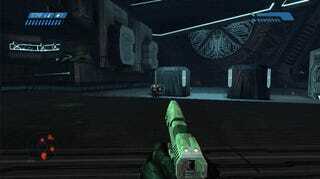 Basic First Person Shooter Anatomy 101: all FPSes are first-person games first and shooters second. The first priority in any good first-person game is to make sure the audience is engaging with the game’s space. It’s all about making fun, interesting spaces, then using the game’s mechanics to get the player engaged. One way to engage players is with great enemies, which Halo has in spades. Each enemy type is visually distinct, “speaks” differently, uses weaponry that’s immediately recognizable, and behaves differently. When you see a grunt, you know you can scare him. When you see an elite, you know he has shields that have to be destroyed. This knowledge informs how you engage with the game world. The weapons you hold inform your combat experience as well. Halo’s infamous pistol is great for long-range encounters, while its assault rifle is better-suited to close-range fights. The Covenant plasma pistol is a great way to take out enemy shields, and the rocket launcher is always welcome when the Covenant’s hulking hunters are around. The type of gun you carry influences your movement—it’s one of the strengths of Halo’s two-gun design. By limiting what you can carry, Halo encourages you to try different loadouts and see how you fare in any given encounter. Then Halo does something fascinating: it shows you the combat space before you enter it, often from a distant vantage point. Prior to Halo, most shooters would have players open a door, enter a space, and shoot monsters as they popped out of their affectionately-named “monster closets.” Maybe an alien would teleport in here, or a marine would rappel from that skylight there. It’s a great way to play, but Halo shows you what you’re up against before you do it, letting you make movement decisions which you can then execute once you’ve entered the encounter. This strategic element of play is a core element of Halo’s design. So, in a first-person shooter like Halo, a designer wants to have engaging spaces, intelligent enemies, interesting guns, and observation. That’s what Halo clearly has up until the introduction of the Flood. More on that in a moment. One thing that sets Halo apart from other shooters is the way it solves a problem all shooters face: monotony. See, the shooter’s greatest strength is the way it allows players to handle objectives creatively. The genre is a mechanical jungle gym. Unfortunately, gamers have a habit of resorting to ‘min-max’ tactics, trying to play as efficiently as possible to clear the game’s content quickly. Min-maxing can be interesting, but choosing to play this way often means creativity gets thrown out the window. This results in a monotonous experience, and shooters, having more freedom than most genres, suffer from this playstyle the most. 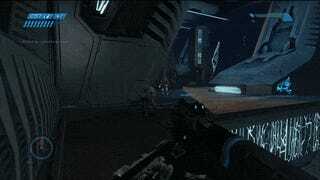 Use of guns is a great way to break up shooter monotony, but Halo had other ideas. When you first encounter the Flood, they’re unlike anything you’ve ever seen. They’re little jellyfish creatures, and you’re trapped in a room with them. It becomes apparent that the inaccurate assault rifle was made for killing these guys, known as infection forms. The onslaught seems never-ending, so when the door finally opens, you rush for an escape. Blocking your exit are zombified, melee-heavy enemy elites. As it turns out, the Flood can resurrect the dead and ‘convert’ human forces too. Up until this point, Halo’s story has been about how you were chased by the Covenant onto this mysterious space object called “Halo,” your ship has crashed, and you’ve been looking to find weapons to defeat the Covenant and escape. It turns out those “weapons” are the Flood, an alien life form with an indiscriminate, insatiable hunger. It’s one of the best twists in video games: the very thing that was supposed to save you is worse than the enemy you were already fighting. Rather than take your guns away—something Halo couldn’t do in a game where its players could only carry two weapons—it introduced a new enemy type, which meant that the entire combat dynamic changed. Guilty Spark, a friendly little robot that runs the Halo facility, transports you to The Library,which contains a device to activate the eponymous Halo’s defenses and murderize the Flood. Sounds like a good idea, right? You gain control over the Halo ring and save your fellow marines from both Covenant and Flood. Awesome. You have your mission: fight your way to the device, take it, and get out. You’ll notice that there are plenty of rocks and Covenant space-crates to hide behind. More importantly, the beach is not flat. This terrain variation helps keep things nice and fresh, because you can’t see everything ahead of you; plus, moving up and down triggers bits of the human brain in a way that’s more compelling than a completely flat plane. The Silent Cartographer is all about dancing around, shooting enemies, sidestepping into cover, regenerating your shields, jumping out again, flushing grunts into the open, popping elite shields… you’re planning, executing, and shooting, all in quick succession. The Library does not care about your terrain variation or cover, nor does it care about the manipulation of individual artificial intelligence. It cares only about death, destruction, and silence, like most libraries. When it hits, it hits hard—down from the ceiling drop waves of infection forms. In a one-on-one battle between you and a single infection form, you’re going to win. Sometimes, they die just by jumping on you, and they do next to no damage. Avoiding infection forms means you’ve got to backpedal—and backpedal hard. Good thing you’re in a wide, open combat space with plenty of distance between you and your foes, right? In any other level, flat space might be completely boring, but when you’re facing a foe that’s constantly advancing towards you, having lots of room to maneuver is a godsend. The massive, open spaces of the level give you plenty of time to fire bursts of assault rifle fire into the infection forms while running away. When you move into the level’s next area, two enemies called “carrier forms” spawn on either side of you. These guys are supposed to be incubators, but in reality, they’re suicide bombers. Once again, we find an enemy designed to push you around the combat space, but in a different way. Get too close to a carrier when it explodes and you’re dead. If that weren’t enough, The Library spawns more combat forms—mutated space marines and enemy elites. Their primary attack is a powerful melee strike that can take out shields in one hit. Apparently this super strength isn’t limited to their melee either—combat forms often move around the map with massive, Hulk-sized leaps. They’ve got the normal Covenant guns, which themselves are easy enough to dodge, but they’ve also got human weapons, which is a big problem. Human weapons are “hitscan” weapons. This basically means that when you pull the trigger, the game draws a path between you and where you’re aiming. If anything intersects with that path—like, say, an enemy—then your hit is instantaneous. There is no time to dodge. So, not only do you have to worry about infection forms peppering your shields or combat and carrier forms doing massive damage in a single hit, you also have to worry about attacks you can’t dodge. This alone makes it the hardest level in the game, but there’s more. 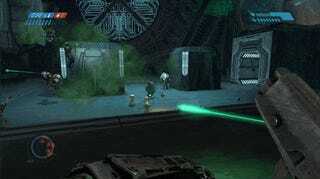 Up until you encounter the Flood, Halo is all about short range encounters with a few seconds of pre-planning. Sure, plenty of shooters had melee, but Halo made melee an integral part of the combat experience. Assault rifles in most shooters are accurate at medium range—Halo’s are ridiculously inaccurate, best for up close and personal engagements. In nearly every fight, Halo pulls you close. Sometimes, you get to punch things. No other shooter has this rhythm—it’s unique to this series (barring Halo 4). The Flood work differently. Get close to an infection form, and you risk your shield. Failure to keep the carriers at bay means you’ll die in a big explosion. Without careful attention to the combat forms, you could be caught off-guard by a sudden melee that wipes out your shields and brings instant death. For some people, this is a problem: it’s like one moment, Halo’s a flamenco dancer, and the next, it’s doing the tango. The dance changes, and some people aren’t ready for it. It’s disorienting. Trying to play Halo like you’ve been playing Halo up to this point leads to inevitable disaster: the Flood aren’t Covenant, and they shouldn’t be fought like Covenant. Covenant pull you close, Flood push you away. This might lead some to think they’re opposites—that Halo becomes an entirely different game when they show up—but that couldn’t be further from the truth. Halo is known for the way it fosters creative and intelligent play. The Flood still facilitate that, just not the same way the Covenant do. Consider this: combat forms drop grenades for you to pick up on death. They don’t use the grenades, so it’s a great way to stock up and use them yourself. One of the cooler things about Halo is that dormant grenades are triggered by explosions. Kill a guy, watch his grenades hit the floor, toss your own grenade, and boom, all the grenades go up in a much larger series of explosions than a single grenade could produce. Now consider this: carrier forms can explode. You can use this to your advantage—an exploding carrier form will kill the Flood forces around it. Not only that, but the game’s physics system ensure that the things they drop will go flying. If you play it smart, you can kill one carrier form, who kills his buddies, who drop grenades, which are then set off by another carrier form that died after the explosion of the first. It’s a massive, Flood-destroying chain reaction! Covenant forces encourage planning and execution; Flood require improvisation. It’s still Halo, just sped up and with more emphasis on shooting and moving, less emphasis on melee. You’re required to think on your feet more, making plans and decisions in the fray, rather than before you begin. It’s still Halo’s logic at work, just operating in a different, more immediate framework. You’ve got to play smart; that intelligence that made the Covenant so fun to fight isn’t gone, just transformed. The Flood keep Halo feeling fresh without simply taking the player’s guns away. When one style of play starts to wear out its welcome, Halo changes things up. Unfortunately, not everyone adapts so well; when a game teaches us to play one way, we tend to like to stick to that strategy. It’s the same idea that drives the min-max approach: we like to find one optimal way to play and stick with it—like a Gears of War player who goes through that whole game using just the Lancer. Halo taught us how to fight the Covenant, then turns things on its head with a bunch of enemies that are best kept at a distance. Where some players are fighting their way through The Library’s intense combat, rapidly strategizing and re-strategizing as situations change, other players are still trying to fight the Covenant. The big, open, flat spaces don’t make much sense. The dependence on getting up close and personal isn’t fun with instant-kill melee attacks and accidental explosions. The Library’s intensity can be challenging to survive. It’s a fairly short level by Halo standards—not as short as 343 Guilty Spark or The Pillar of Autumn, but definitely nowhere near as long as Halo, The Silent Cartographer, Assault on the Control Room, or Keyes. However, by being the game’s most intense, Flood-centric level, it certainly feels long, especially if you aren’t used to it. This isn’t helped by the fact that The Library repeats a lot of its geometry. Truth be told, Halo, the game, repeats a lot of its geometry. Assault on the Control Room and Two Betrayals are functionally the same level, one making you move forward against the Covenant, the other backward against the Flood and the Covenant. Both levels feature a single combat arena that’s repeated ad nauseum. The Pillar of Autumn reprises The Maw. Truth and Reconciliation and Keyes both occupy the same spaces. Halo has always been about recontextualizing space. Go through an arena one time with one mix of enemies, go back through it with another mix. Replaying a level backwards, adding in the Flood, and changing the mix of Covenant makes it feel fresh, even when it isn’t. Sure, Assault on the Control Room is the longest level in the game, but it’s constantly doing new things—even when you’re playing in the same combat arena, you’re facing hunters in one room and invisible elites the next. It feels different, even if it isn’t. The Library changes up the specifics of its encounters, but the massive, open spaces throughout the level, combined with just three main Flood types, can sometimes give the impression that there’s less variety than there really is. It doesn’t help that the original Halo’s textures left something to be desired. While I have my concerns about the busy art direction 343 Industries took with their remake, it’s definitely more visually exciting than the original level. Players traverse four floors in The Library, each with its own distinct flavor. One floor features multiple narrow tunnels with no room to strafe, only space to advance or retreat. Another floor repeats lots of hallways. Yet another has huge vertical spaces with no cover at all. Sometimes you’re fighting alongside friendly drones. Other times, you are alone, trapped in a room with no way out, waiting for Guilty Spark to return and open the doors. There’s variety here, even though the design of the level demands mostly large, open spaces with lots of room to move around. If anything, it shows how important strong art design is to making a level feel engaging, even more than great mechanics. If it looks repetitive, it will feel extra-long and boring, even if the gameplay is fun. If it looks fresh, even when it isn’t, audiences will enjoy it a lot more. The lack of texture variety in the original level made The Library feel more repetitive than it really is. My favorite part about The Library is the way it ambushes players. I’m a big fan of the occasional ambush, which is one of the reasons I enjoy Half-Life so much. The Library rains monsters down from massive vents in the rooms. One of my favorite moments in The Library is when players round a corner to come face to face with an army of carriers. Suddenly, a combat form at the end of the hall fires a rocket, detonating all the carrier forms at once. It takes some clever maneuvering to avoid that on higher difficulties. To inattentive players, these ambushes can be frustrating. Once again, it’s an element that’s not often found in other Halo levels. Normally, you have time to observe things. In The Library, things are much more immediate. It’s easy to see why people might not like the level. The original’s lack of texture variety and repeated geometry, coupled with the dizzying gameplay shift, was a recipe for confusion. For my part, I love The Library. I love the unpredictability of it all, the chaotic madness of dealing with 30 different enemies at once, all of them armed with the entirety of Halo’s arsenal and howling for my blood. It’s a good twenty minutes of pure panic mode, and every time I return to The Library, I find myself in its thrall. Halo’s biggest misstep with the Flood takes place not in The Library, but in Keyes, a level featuring tight corridors with little room to strafe or backpedal. Keyes’ tight corridors makes it far more challenging to put distance between you and the Flood. You’ve got the Covenant to contend with on top of that. Keyes is a level with weird moments of ease punctuated with occasional, boring difficulty spikes. I don’t believe there is anything innately bad about the Flood. I think a lot of people dislike them because they force such a drastic change in pace from the Covenant. And, hey, the Covenant are some of the best enemies in shooter history. Halo isn’t content to give you the same thing ad nauseum; it wants to switch things up. The Library is a wonderful change in pace, so long as you take it on its terms. Brute-forcing your way through its corridors because that’s how you’ve always done it will get you nowhere. The Library is Halo’s ultimate test of skill, its finest gauntlet. It produces an adrenaline rush like no other. Yes, it’s a challenge, but it’s supposed to be. That’s what makes it so cool.